During the recent 3D Systems’ 2014 Investor & Analyst Day, one of the key issues addressed was the new frontiers in medical technology. At 3D Systems, healthcare appears to be the fastest growing market. The management team stated its plans to build up its leadership in this field. The company plans to invest and expand its virtual surgical planning (VSP®) capabilities, broaden its range of implants and surgical tool manufacturing and develop new personalized medical devices, such as the recently introduced bespoke scoliosis brace. Visit St. Basil Cathedral from the safety of your desk. 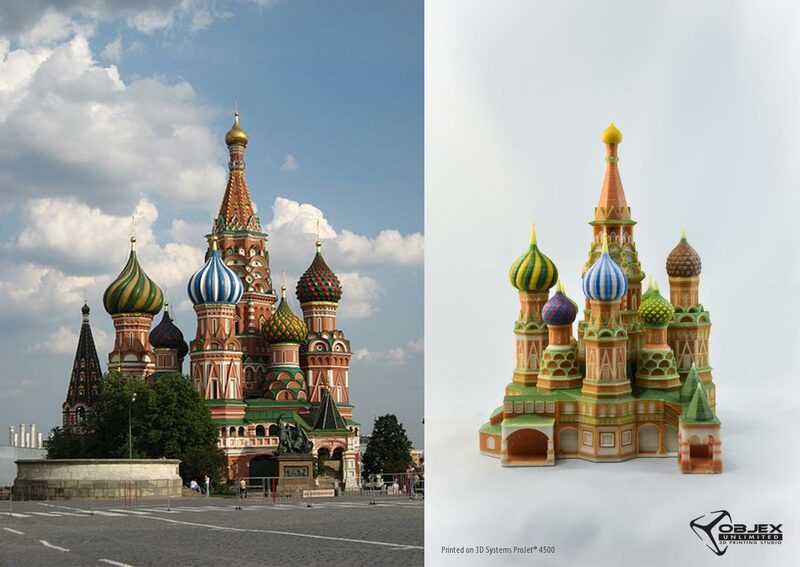 Russia’s famous St. Basil’s Cathedral. Printed on a 3D Systems ProJet® 4500. How does it compare to the real thing? To learn how we can help you with your next project, don’t hesitate to request a quote. We’ll help make your ideas a reality. 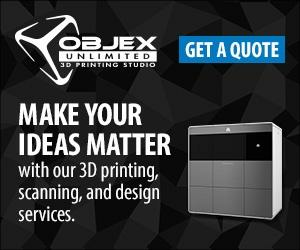 Objex Unlimited is your resource for everything 3D. We take great pride in the services we provide, and will find the best 3D printing solution for you. We will work with you to complete your project and reach your goals ahead of schedule. We offer a variety of 3D printers, 3D scanners and 3D software, and will work with you to find the best solution for your needs. We are an authorized reseller of 3D Systems, Artec Group, LMI Technologies, Geomagic and Agisoft 3D products. Our talented and diverse staff deliver high-quality, industry-leading results. Our commitment is to fulfill your project needs within budget and on-time. 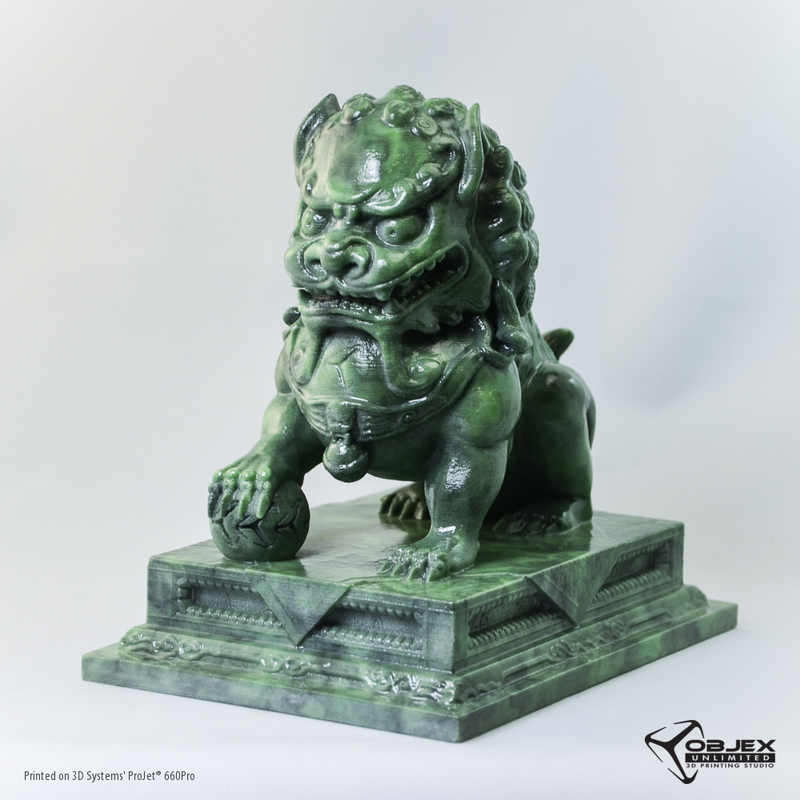 Guardian Lion Statue. Printed on a ProJet® 660Pro by Objex Unlimited. This model was created completely from scratch by one of our Objex designers, Craig Reid. Using ZBrush and some reference photos, the statue’s geometry is sculpted from a sphere using pulling and carving techniques, much like sculpting clay. 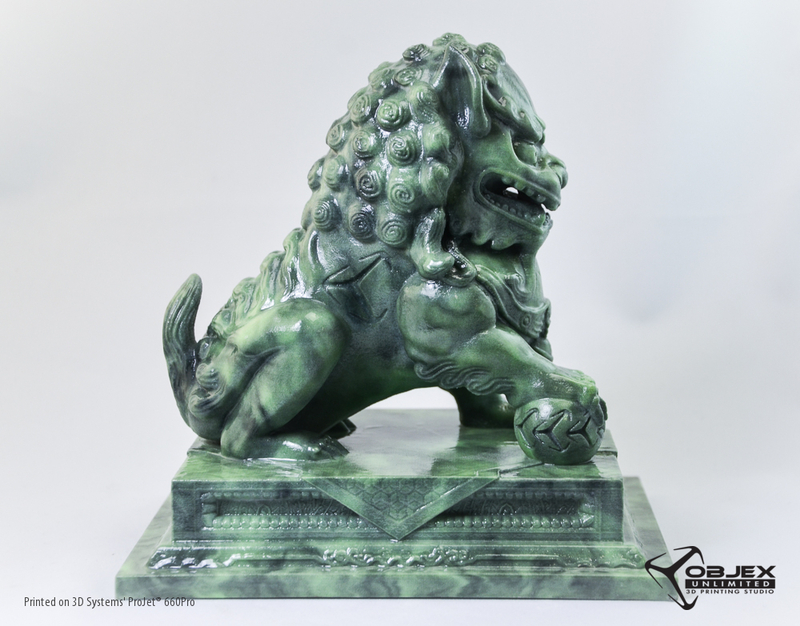 We chose to print the Guardian Lion model on the 3D Systems ProJet® 660Pro, a type of ColorJet 3D printer. ColorJet Printing (CJP) involves two major components: core and binder. Core material is spread in thin layers over the build platform with a roller. After each layer of core material is spread, color binder is selectively jetted from inkjet print heads over the core layer, causing the core to solidify. The build platform lowers with each subsequentlayer of core and binder until the model is complete. The advantage to using the ProJet® 660Pro for this particular print is the ability to print in full photo-realistic colour. 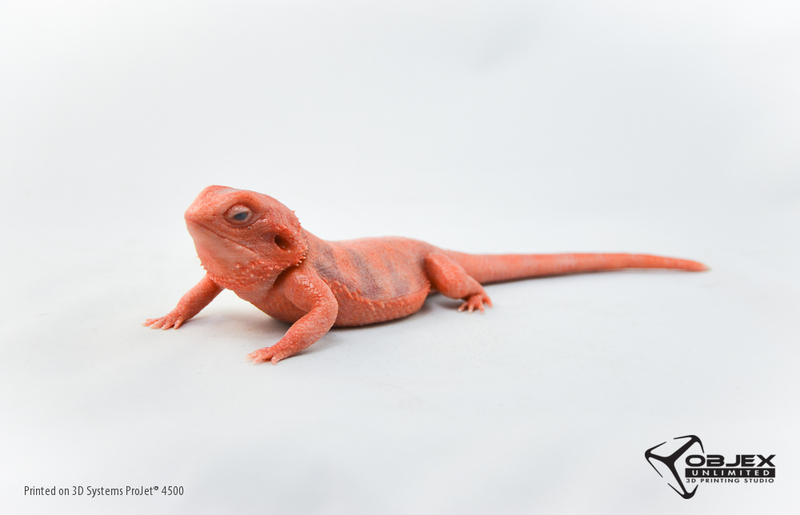 The 660Pro utilizes the full CMYK colour spectrum, printing true black for the most realistic colour representation. This kind of colour detail is only possible on a ColorJet Printer. 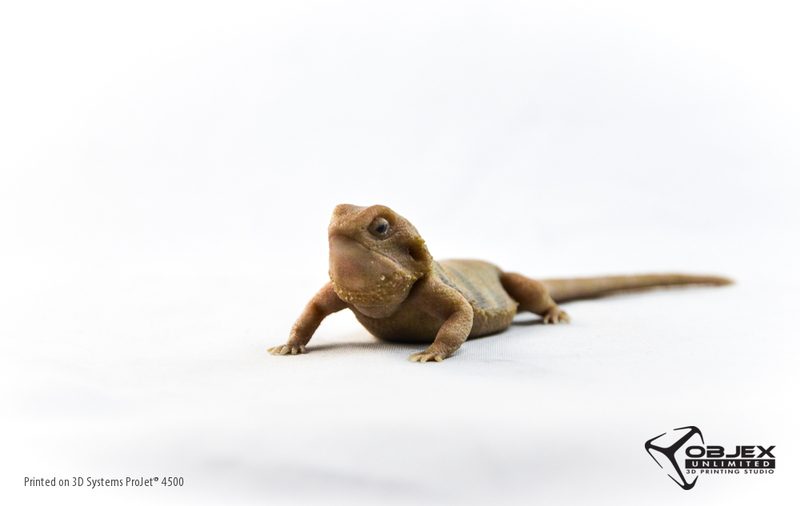 Bearded Dragon. Printed on ProJet 4500 by Objex Unlimited. This model was created completely from scratch by one of our Objex designers, Craig Reid. 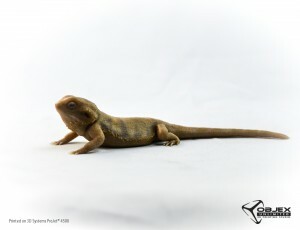 Using ZBrush and some reference photos, the lizard’s geometry was sculpted from a sphere using pulling and carving techniques, much like sculpting clay. We chose to print this Bearded Dragon model on the 3D Systems ProJet® 4500, a type of ColorJet 3D printer. ColorJet Printing (CJP) involves two major components: core and binder. Core material is spread in thin layers over the build platform with a roller. After each layer of core material is spread, color binder is selectively jetted from inkjet print heads over the core layer, causing the core to solidify. The build platform lowers with each subsequentlayer of core and binder until the model is complete. There are two major benefits to using the ProJet® 4500 for this particular print. First, the obvious advantage in printing in full-color. The ProJet 4500 utilizes up to a million colours, or the full CMY colour spectrum. All colour details are easily textured on, enabling complex, realistic patterns, only possible on a ColorJet Printer. Second, the durability of the plastic. This model has many fine details such as the thorns and scales. The plastic allows the fine details to remain intact coming out of the printer, whereas many of these details would likely break-off on other powder printers. We also printed him in red! Spectacular Savings on Geomagic Products! For a limited time, Objex Unlimited is offering special deals on Geomagic software. Find out more below and take advantage of our exciting promotions today! 1. Professional Designer Package – Save 24%! Ready to elevate your design experience! With 3D Systems, and this new promotion, getting from scan-based design to print has never been easier. This package comes with Geomagic Capture for Wrap and the new CubePro Trio! Scan, design and print right at your desk. 2. Geomagic Capture for Wrap – Save 25%! Geomagic Capture for Wrap is our newest offering for our scan-based design product line, but it’s only for a limited time! Take advantage of our Capture scanning device paired with the power of auto surfacing and design capability of Geomagic Wrap that will ramp up your design process and help get to market faster! Whether you are currently enjoying our maintenance program, or have not renewed recently and want to come back, we have a great deal for you! Purchase 2 years maintenance at 10% off, or purchase 3 years maintenance and qualify for 20% off. Continue to receive free upgrades, access to our technical support team and more! 4. Starter Scan-Based Design Package – Save 21%! Whether you’re just getting started with scan-based design, or want to unleash the creative talent of one of your teammates, this package gives you the tools you need to get going. It comes with Sense, Geomagic Design and a Cube3D Printer. Scan with confidence, utilize our user friendly CAD platform, and print on your new Cube 3D printer in just a few steps. It’s that easy. 5. Special pricing on Capture for Wrap, Freeform and Touch – Save 20%! Unleash the power of voxel based modeling with the power of haptic feedback by combining Capture for Wrap with Geomagic Freeform. This package comes with two hardware devices, our blue light scanner and the Touch haptic device. It also includes first year maintenance which provides additional hardware support along with access to technical support and more. 6. Special pricing on Freeform Plus and Touch X and Studio – Save 38%! Take your manufacturing to a new level. Freeform Plus and Touch X provide the tools you need to make models ready for any type of manufacturing process you currently use, and speed up the process to get you there. Add the power of scanning to your workflow to bring in your physical design and improve on it in minutes. https://objexunlimited.com/objexunlimited/wp-content/uploads/2017/11/OBJEX_LOGO_WHITE_17-copy.png 0 0 Objex Unlimited https://objexunlimited.com/objexunlimited/wp-content/uploads/2017/11/OBJEX_LOGO_WHITE_17-copy.png Objex Unlimited2014-07-29 15:00:322014-07-30 20:25:07Spectacular Savings on Geomagic Products! 3D Systems (NYSE:DDD) announced today that two of its Bespoke design applications have been awarded by the 2014 International Design Excellence Awards (IDEA) from the IDSA and Core77. Both the 3D printed personal Ekso robotic exoskeleton and Bespoke Braces for hand and wrist were recognized, with the Ekso being awarded Bronze in the Social Impact category. Bespoke Braces for hand and wrist, currently in its pilot phase, is a first-of-its-kind medical solution to scan, design, and print custom hand and wrist braces. In the Bespoke Braces process, a patient’s arm is scanned and data is transmitted to cloud-based servers where a brace design, customized by the patient and clinician, is created to match the shape of the patient’s individual anatomy. Each brace is then 3D printed using 3DS’ selective laser sintering (SLS) technology for optimal comfort, flexibility and durability. The Bespoke Braces system is comprised of an arm scanner, an iPad app, cloud software, a network of 3D printers, and four revolutionary arm brace designs. This service has recently been expanded to include custom scoliosis braces for children and young adults. 3D Systems (NYSE:DDD) announced on Tuesday July 8th, that the company ranked number 13 in Forbes’ list of the most innovative companies with a market capitalization under $10 billion. This distinguished ranking singles out the top 100 companies that demonstrated continued growth through innovation. 3D Systems announced on May 29, 2014 that its ProJet® 3510 MP 3D printer and proprietary VisiJet®Pearlstone dental material have been verified by 3Shape for prosthodontic dental model production. Verified and integrated with 3Shape’s Model Builder software, 3DS’ ProJet 3510 MP is a proven solution for manufacturing prosthodontic dental models with accuracy, precision and push-button simplicity. 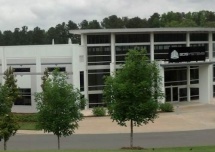 Offers online access to 3DS’ production facilities for on-demand model production. Objex Unlimited carries and services both the ProJet 3510 MP and VisiJet Pearlstone material. For more information, contact us or get a quote. 3Shape is a Danish company specializing in the development and marketing of 3D scanners and CAD/CAM software solutions designed for the creation, processing, analysis and management of high-quality 3D data for application in complex manufacturing processes. 3Shape envisions the age of “full digital dentistry,” and its 400 employees, including more than 175 developers provide superior innovation power toward reaching this goal. 3Shape’s flexible solutions empower dental professionals through automation of real workflows, and its systems are applied in thousands of labs in more than 100 countries worldwide, putting 3Shape technologies at the peak of the market in relation to units produced per day by dental technicians. With TRIOS®, 3Shape now brings its vast expertise and innovation power directly to dentists. 3Shape boosts its first-line distributor support network with a training and support force of over 50 in-house experts placed in 6 support and service centers strategically located around the globe. 3Shape is a privately-held company headquartered in Copenhagen, with the market’s largest team dedicated to scanner and software development for the dental segment based in Denmark and Ukraine, production facilities in Poland, and Business Development & Support Offices at several locations in Europe, in North America, Latin America and in Asia. For further information regarding 3Shape, please refer to www.3shapedental.com. Visit us on www.facebook.com/3shape, or view our mobile site onm.3shapedental.com.